11 Şubat 2019 Pazartesi 17:00 - 2 reads. continuity and stability should also determine after a Brexit, the relations between Switzerland and the United Kingdom. 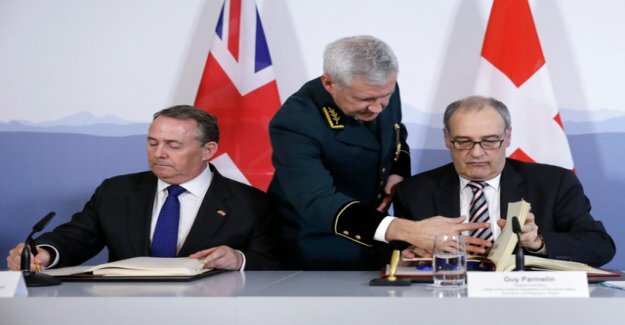 Federal councillor Guy Parmelin, and the UK's Minister for international trade, Liam Fox, signed in Bern on Monday a bilateral trade agreement. With the signing of the trade agreement, Switzerland has taken an important stake of their "Mind the Gap"strategy with the UK (as complete as possible to continue the relationship). Already in the last year, the two countries ' agreement on road transport signed, to the air traffic and to the insurance companies. In December, it was adopted also a Convention on the rights of the citizens. Minister of economy Parmelin said on Monday, following the signing, the United Kingdom, with a volume of 11.4 billion francs, the sixth most important market for Swiss goods exports, and the eighth largest origin market for imports of goods (of around 6 billion Swiss francs). Switzerland is Vice-versa for the UK is the fifth most important export partner outside the EU. The major part of the present and future relations to be regulated by the new trade agreements in an orderly or disorderly Brexit, said Parmelin. The agreement represents a solid Basis for future economic relations. The same Horn, the British Minister for trade joined. Liam Fox stressed to appropriate questions a number of times that the UK wants to leave EU with a Deal. This is the best way. The new trade agreement between Switzerland and the UK, is a replication of a large part of the currently applicable trade agreements. It is the free trade includes agreement of 1972, the Convention on public procurement, the anti-fraud agreement. In certain sectors of the agreement, including the mutual recognition of conformity assessments (MRA) and the agreement on Agriculture, however, has not been taken all the points. Parmelin referred to the veterinary agreement, in which there were still gaps. Should be concluded between the EU and the UK is no agreement, the United Kingdom, namely, not more of the same veterinary area belong to Switzerland, and would then have the Status of a third country. In this case, the importation of animals and products of animal origin from a third country to Switzerland only to specific conditions. It is, therefore, according to the Federal food safety and veterinary office (fsvo), it cannot be ruled out that in Switzerland at the time of the withdrawal of the United Kingdom from the EU to a disruption in trade with animals and products of animal origin from the UK, until the EU has included UK in the list of third countries. Switzerland is one of the first countries which have concluded a separate agreement with the UK. The new agreement occurs when a disordered Brexit from the 30. March in force. In the case of a child Brexit and a possible transition phase, the bilateral Swiss-EU agreement will continue to apply to the relations to great Britain.